I can offer a variety of programmes to suit particular requirements, from short recitals and guest appearances to full length concerts, solo concertos to illustrated talks. The programmes below are suggestions and can be flexible. If you are after something specific, please drop me an email via my Contact page. This title is inspired by two works separated by over 350 years. Van Eyck’s ‘Fantasie and Echo’ challenges the recorder to produce contrasts of forte and piano, one of the first pieces to stipulate dynamic markings, while Markus Zahnhausen’s ‘Lux Aeterna’ uses a range of techniques including harmonics to depict subtle shades of light in one of the most haunting and ethereal pieces of music for any instrument. Recurring fragments, repeated patterns and variations are woven together in works by Bach, Rubra, James’ own arrangement of ‘Spiegel im Spiegel’ and a dazzling set of variations by the Paganini of the recorder and others. The recorder can lay claim to a vast and varied repertoire, much of it by composers whom history has largely neglected or whose reputation lies elsewhere… In the Bach and Beyond we follow the recorder down some of the lesser-trodden pathways of musical history and celebrate the rarely heard and the undiscovered. Recorder Renaissance celebrates the rediscovery of the recorder during the 20th century in England which saw its fortunes transformed from a museum relic to fully-fledged concert instrument. The programme features several works commissioned by Carl Dolmetsch for his long-standing annual concerts at the Wigmore Hall by such distinguished composers as Lennox Berkeley, Norman Fulton, Donald Swan, Gordon Jacob and York Bowen. Continuing Dolmetsch’s spirit of encouraging new repertoire, the programme also includes ‘Time out of Mind’, written in 2008 for James Risdon by Alan Davis. The lone voice of a recorder has inspired many composers over the centuries. Some have been drawn by its pure, vocal qualities and ability to sustain long melodic lines, whilst others have explored its great potential for virtuosity and unusual effects. Echoes of Arcadia – the title of my first CD – explores some of the most enduring music written for solo recorder and charts the rise and fall of the instrument through history from the pleasure garden to the mountain valley, the tropical jungle to ice-cold minimalism, ethereal to electronic. With its position at the heart of Europe, it is perhaps no surprise that the music of France in the 18th century displayed so much variety in style. This programme offers a glimpse into the music of France during the 18th century played on three distinct sizes of recorder. Included are the elegance of Hotteterre and Dieupart, the daring harmonic invention and virtuoso writing of Leclair and Blavet, the only known authentic recorder sonata by a French composer, as well as a French hurdy-gurdy player’s unashamed parody of Vivaldi. Handel’s recorder sonatas, first published in around 1730, arguably represent the pinnacle of writing for the instrument in the 17th and 18th century. 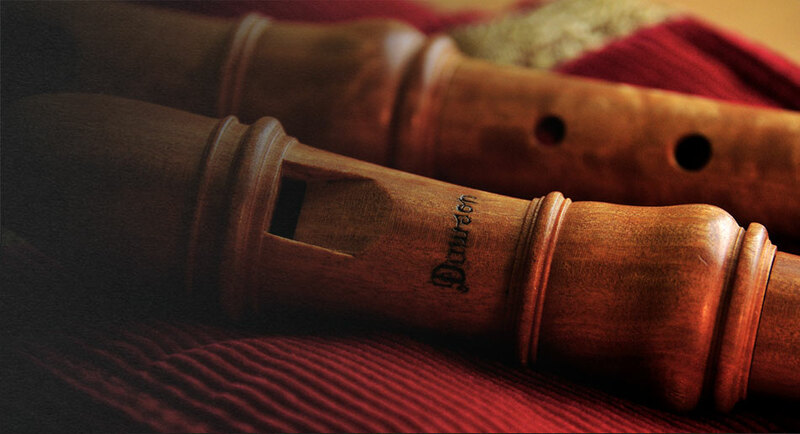 Each is perfectly crafted, full of invention and exploits perfectly the colour and character of the recorder. That said, at least one of them was originally intended for the flute, three included material recycled from earlier works and two were later incorporated into organ concertos. Following the example of Handel’s rather more flexible approach to instrumentation, I offer four of the sonatas known to be written for recorder, as well as two others probably written for violin or flute but which work equally well on recorder. This programme can be given in the form of either a straight concert or illustrated as a lecture recital. This exciting programme traces the Italian composers whose music found its way across Europe as far north as Scotland, as well as Scots composers venturing southwards in search of fame and fortune. We start in 17th century Venice with the colourful and daring music of Castello and end up over 1,000 miles north and 150 years later in Scotland via Spain, Austria and London. This programme is an unashamed celebration of celebrity, 18th century style. Works by four of the most famous composers and musicians throughout Europe show how national styles and forms made for a kaleidoscope of musical colour. Works include a typically folk-infused trio by Telemann, a reworking of a Bach organ sonata, a dazzling concerto by Vivaldi and finally one of Handel’s finest chamber works from his Opus 2 set.